GTFO, the movie, premiered at SXSW in 2015 and is now available from a number of outlets. Created by Shannon Sun-Higginson, the documentary takes a look at sexual harassment in gaming. Sparked by a public display of sexual harassment in 2012, GTFO pries open the video game world to explore a 20 billion dollar industry that is riddled with discrimination and misogyny. In recent years, the gaming community has grown more diverse than ever. This has led to a massive clash of values and women receive the brunt of the consequences every day, with acts of harassment ranging from name calling to cyber vandalism and death threats. Through interviews with video game developers, journalists, and academics, GTFO paints a complex picture of the video game industry, while revealing the systemic and human motivations behind acts of harassment. GTFO is the beginning of a larger conversation that will shape the future of the video game world. You can buy or rent GTFO on iTunes, Vimeo, BitTorrent, Google Play, Xbox, Playstation, and Vudu. The film is available for educators at the movie web site, which has resources for women who are being harassed. Time Magazine interviewed Sun-Higginson in Meet the Woman Helping Gamergate Victims Come Out of the Shadows. It’s worth reading. I was impressed by this headline, People Want Female Warrior Gaming Miniatures So Much That They Funded This Kickstarter Campaign In 30 Seconds. After I read the amazing story I went to the actual Kickstarter page for Raging Heroes to see what the total raised was. Then I was really amazed. Game makers, if you think there’s no support for women in gaming, you’re either in denial or throwing away a ton of profit. Understanding 3D Transforms is from Opera Dev. Do you have a Yahoo email address? I do. I have it set to forward to my regular email, however, so I almost never sign in to Yahoo to look at it. If you haven’t signed in to your Yahoo email within the last 12 months, you will lose your account. Log In to Your Yahoo! Mail Address or Lose it On July 15th. When signing in to Yahoo to let Yahoo know I want to maintain that account, I noticed they are using two-step verification now. I first noticed the uproar over #1reasonwhy in this post: As Of Right Now, Women in Games and Tech Are Tweeting About Industry Sexism, Offering Mentoring To Others at The Mary Sue. I went to Twitter and searched on the hash tag and the number of posts coming in were so rapid I couldn’t even read them before they were gone. Since then, The Guardian has published a more comprehensive post on the topic, #1reasonwhy: the hashtag that exposed games industry sexism. Here are just a couple of the more hopeful posts out of a sad Twitter stream on #1reasonwhy. Will the worst offenders in the gaming industry be changed by the conversation? I hope so. Congratulations to those who spoke out about their treatment, and to those who offered mentoring and help to others. Those folks in Kansas City know how to celebrate an anniversary – specifically the 40th anniversary of Pong. Being of an age, I can remember the days when we went out at night just to play Pong at the local bar because there was no such thing as a home based video game system. Happy Anniversary and congratulations to Atari. What are the people who make games for you and your kids thinking about and talking about? One way to keep an eye on this is by watching The Games for Change Festival. The 9th annual festival took place June 18-20 in New York City. This year’s festival included big name speakers and announcements of new games as well as the release of tools to enable you to create your own games. Topics ranged from the science behind what’s going on in your brain as you play to the appeal of the graphic interface in a game environment. You can find some of the talks at Livestream/G4C if you’d like to catch up on events. Game-o-matic, a Knight News Challenge-funded collaboration between the Georgia Institute of Technology and the University of California at Santa Cruz, is a tool for generating journalistic games (or newsgames) through a simple “concept mapping” of relevant actors and their relationships. A game called Dojo will help you regulate your own body’s function biofeedback style. Many more games for learning, for health, for social change, and yes, even for marketing (you knew that would be there) were intoduced, discussed and demoed. There were awards. Check the list of nominated games at 2012 Games for Change Awards nominees to see the type of games considered worthy by this group. Prior to the event, Michelle Morrow interviewed Games for Change Co-President Michelle Byrd. It’s an interview worth reading. Here’s how Byrd described getting involved with G4C. I had just stepped down from my position running a non-profit independent film organization. I wanted a change. I wanted to be involved in supporting media that was trying to make a difference in the world. Sometimes “Games for Change” related popped up in my Twitter feed. Whatever they were tweeting about intrigued me so I did some investigating. A couple of weeks later I was in Soho having lunch with one of the founders and learning about something that I had no idea about – the intersection of games and social change. By the time she started telling me that the organization was developing a game based on a book I was obsessed with at the time – Nick Kristof and Sheryl WuDunn’s Half the Sky – I was hooked. I met Asi Burak, a game developer, and a couple of months later we had an opportunity to team up and put ourselves forward as a new leadership team to run the organization as Co-Presidents. Kind of crazy how organic the whole transition has been. Later in the interview she was asked what was most exciting about this year’s event. Her answer reflects the reason that all of us should be interested in what game developers are doing. Convergence.The best and most unique feature is the sheer convergence of ideas, people, causes, passions.It’s a committed crowd coming from numerous disciplines – game designers, developers, publishers, cause owners, academics, non-profits and NGOs. It’s the convergence of worlds which don’t necessarily interact in a daily on-going basis. Since the festival is in progress as I write this, Twitter is the best way to give you a sense of the conversation there. Here’s a sampling of tweets. 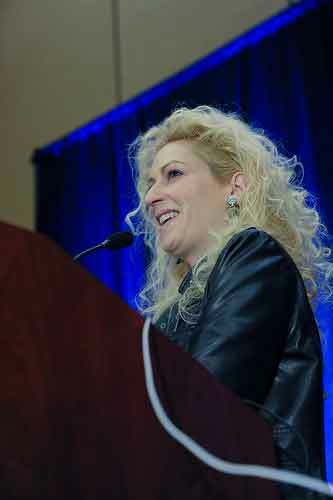 Keynote speaker Jane McGonigal made Twitter go crazy when she announced that her company Gameful will being official work with Games for Change. McGonigal promised to increase the life of everyone in the room by about 7 minutes, which prompted this tweet to the science behind her statement. For those of you who are skeptical about the value of games, this is the tweet to click through. RT @Half #G4C12 @aburak announces that @Half the Sky will be launching not only a Facebook game, but games for smart and feature phones too. The conversation is ongoing through June 20 on Twitter using #G4C12 as the identifier. Are video games good for girls? The things she points out probably also apply to boys, but this is an interesting report. I’m jealous of WordPress 2.0 for Android. I don’t blog from my iPhone, but I do use the WordPress app for iOS to check comments when I’m away from my computer. Look at what the Android app can do. Here’s hoping these improvements are coming to iOS soon. Does anyone us an iPad to blog? I looked at it early on as a potential blogging tool and it didn’t seem up to the chore. Is anyone using an iPad to blog successfully? How to Make Forms more Usable with HTML5 is a good tutorial from Steven Bradley. The new WeTopia game on Facebook is described by TechCrunch. This game is a perfect example of what Jane McGonigal and other thinkers say about using game theory to create social good. NC State U evaluates the accessibility of Moodle 2.1.1. If you are like me and your subscription to 24 ways has been languishing quietly in your feed reader since last December, you know that 24 Ways is back. If not, be sure to check them out and have a great December with 24 Ways.